• Federal Electoral District Souris-Moose Mountain M.P. • Provincial Constituency Estevan M.L.A. 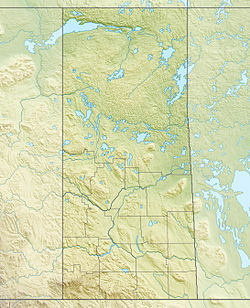 Midale, Saskatchewan is located on Highway 39, midway between the cities of Weyburn and Estevan. The population of Midale is 562. It is 160 kilometres (100 miles) southeast of Regina, Saskatchewan. On July 5, 1937, during the great depression (and drought), Samuel Molberg recorded the highest temperature ever recorded in Canada at 45 °C (113 °F). This temperature was also recorded that same day in Yellow Grass, Saskatchewan (64 kilometres northwest). Midale is a town in the rural municipality of Cymri No. 36, in the Canadian province of Saskatchewan. Midale is home to country musician Brad Johner. Mainprize Regional Park is located just 12 kilometres away. Rafferty Dam Reservoir on the Souris River is just south of Midale. Midale has a humid continental climate (Köppen '′Dfb′'). On 5 July 1937 a maximum temperature of 113 °F (45.0 °C) was recorded, which is, along with that of the village of Yellow Grass, the highest temperature ever recorded in Canada. ^ "2011 Community Profiles". Statistics Canada. Government of Canada. Retrieved 2014-04-09. ^ National Archives, Archivia Net. "Post Offices and Postmasters". Archived from the original on 2006-10-06. Retrieved 2014-07-15. ^ Government of Saskatchewan, MRD Home. "Municipal Directory System". Archived from the original on 2016-01-15. Retrieved 2014-07-15. ^ Commissioner of Canada Elections, Chief Electoral Officer of Canada (2005). "Elections Canada On-line". Archived from the original on 2007-04-21. Retrieved 2014-07-15. ^ a b "Midale". Canadian Climate Normals 1981–2010 (in English and French). Environment Canada. Retrieved 4 June 2016. ^ "Top Weather Events of the 20th Century". Environment Canada. May 2010. Retrieved January 26, 2013. ^ "Midale, Saskatchewan". Canadian Climate Normals 1971–2000 (in English and French). Environment Canada. Retrieved January 26, 2013. This page was last edited on 8 May 2018, at 03:52 (UTC).